Now through Monday 11/4 on Maidenform.com, get 3 select styles of Weightless Comfort Shapewear for only $9.99! Plus, use coupon code COUPSCP13 to drop the prices to $8.49. Shipping is free on orders of $75 or more or pay flat rate shipping of $7. CVS & Walgreens Photo Deals 11/3! -Save 50% on an 8.5x11 Custom Cover Photo Book with code CUSTOM50. Offer ends 11/9/13. -Save 30% on 60 or more Cards at CVSphoto.com. Use code CARD30 at checkout. Offer ends 11/9/13. -Canvas Prints are now 25% Off at CVSphoto.com. Use code CANVAS25. -Photo Gifts are now 30% Off at CVSphoto.com. Use code SPECIAL30 at checkout. Offer ends 11/9/13. -40% off Photo Orders. Coupon Code: SALE40. Offer ends 11/6/13. -$30 off Photo Orders of $60+. Coupon Code: WALG30. Offer ends 11/30/13. -20% off Photo Orders. Coupon Code: 20PERCENT. Offer ends 11/30/13. -30% off Calendars & Books. Coupon Code: CALENBOOKS. Offer ends 11/30/13. 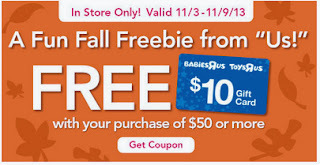 Head over HERE to print a coupon valid for a FREE $10 Gift Card with a $50 purchase 11/3-11/9 at Babies "R" Us or Toys "R" Us stores. Fine Print: Offer available in store only. Excludes baby food, diapers, formula, wipes, Hot Price items, Baby Jogger, BOB, Boppy Bare Naked Pillow, Britax, Bugaboo, ERGObaby, Mamas &amp; Papas, Maxi-Cosi car seats, Motorola, Pediped, Peg Pérego, Phil &amp; Teds, Quinny, Robeez, Thyme Maternity, electronic learning toys, netbooks, tablets, video game hardware, video games, Apple products, FAO Schwarz toys, Isis products &amp; classes, Buyer Protection Plan, gift cards, phone orders, Special Orders, assembly fee, breast-pump rental fee, delivery fee and shipping &amp; handling. Quantities limited; no rain checks. Promotional Gift Card valid beginning 6 hours after activation and expires 2/1/14, except where prohibited. Limit one Promotional Gift Card per guest. See card for Terms &amp; Conditions. See store or Toysrus.com/helpdesk for return policy details concerning this promotion. One coupon per guest. While supplies last. No substitutions or rain checks. Not valid on prior purchases. Must be surrendered at time of purchase. Void where prohibited. Valid USA only. Cash value 1/100 of 1¢.